2011 saw the 55th birthday of Cecil B. DeMille’s classic biblical movie The Ten Commandments, and Paramount Home Entertainment celebrated with the release of a six-disc Blu-ray/DVD combo gift set plus two-disc DVD and Blu-ray sets on March 29, 2011, in time for the Easter season. The 1956 epic movie tells the story of Moses, played by Charlton Heston (Soylent Green), as he turns his back on his life of privilege with the Pharoah (Yul Brynner, Escape From Zahrain) and leads his people to freedom. Anne Baxter (All About Eve), Vincent Price (Edward Scissorhands) and Edward G. Robinson (The Stranger) also star in the film. 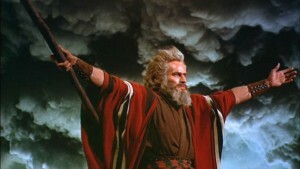 Paramount has fully restored The Ten Commandments for its high-definition debut. The 220-minute film was the last to be directed by DeMille, who also helmed 1949’s Samson and Delilah and 1952’s The Greatest Show On Earth. 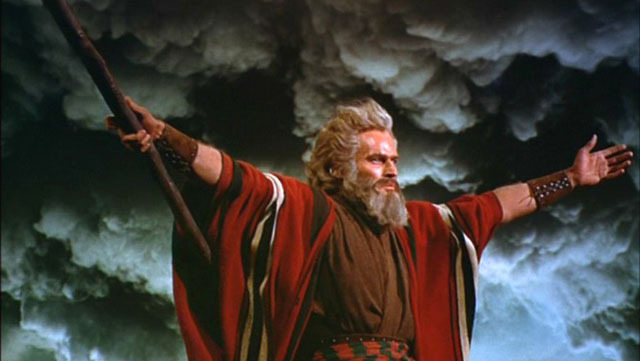 The Ten Commandments won an Academy Award for its special effects and was nominated for art direction, cinematography, costume design, film editing, sound and the biggie, Best Picture. Priced at $59.99, the Blu-ray/DVD combo gift set is packaged in a limited edition box featuring an image of the Red Sea that parts when the box is opened, revealing two tablets inside holding all six discs. The box also contains a photo and archive book, and the discs will offer a new 75-minute documentary about the film and its impact, original costume sketches, the 1923 silent film The Ten Commandments (also directed by DeMille) and correspondence from Heston. The two-disc Blu-ray set was priced at $24.99 and the two-DVD set at $14.99. and newsreel footage of the film’s New York premiere. Many of the special features have been available since 2006 in The Ten Commandments: 50th Anniversary Collection DVD .